For the truly adventurous and open-minded traveller, Haiti is an unexplored gem. This most intoxicating of islands is awash with colour, from the emerald pool of the Bassin Bleu to the gingerbread buildings of Port au Prince. Witness the island's African roots during a Vodou (voodoo) ceremony, and explore the thriving art scene in the capital. A trip highlight is our hike to the awe-inspiring UNESCO site of La Citadelle, perched atop the forbidding peak of Bonnet a l'Eveque. Haiti is an extraordinary country that cannot disappoint. There are great variations in the altitude and terrain of the areas visited and this is reflected in the temperatures. Desert areas can be extremely hot in the summer months (49°), though temperatures can drop dramatically at night. The mountains are cooler and wetter especially in the north of the Rockies. At the beginning and end of the season there may still be some snow around in the high passes and it can be cold, whereas in mid-summer the day time temperatures can soar. A light raincoat is essential, along with trail shoes or walking boots for hikes in Jacmel and Cap Haitien. The temperature in Haiti is warm all year round, but we recommend light layers for the evenings and long sleeved tops in the Parc la Visite to avoid biting insects. Bring swimwear for the Bassin Bleu. Walking or trail boots are essential for the walks in the Parc la Visite and at the Bassin Bleu, plus comfortable trainers and/or sandals. One main piece of luggage and a daypack. Remember you are expected to carry your own baggage so don't overload yourself. We recommend you bring a sunhat and sunscreen as the sun can be strong, and insect repellent. A water bottle is essential. A torch, a beach towel or travel towel and an umbrella may come in useful. 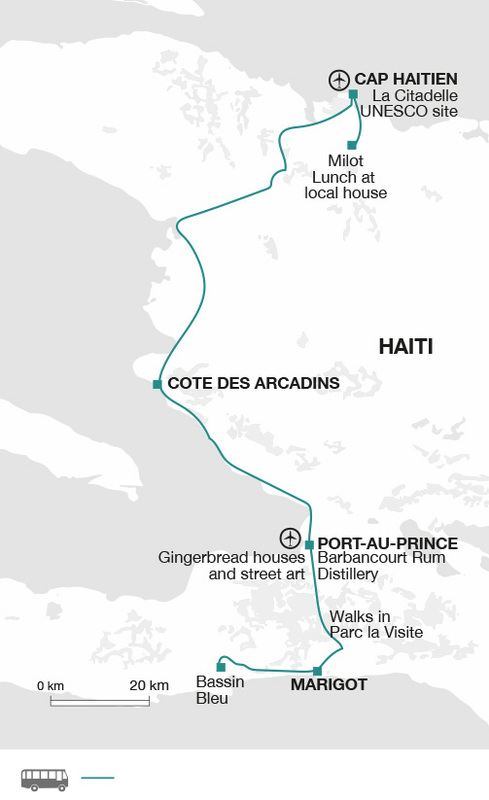 You may wish to consider walking poles for the walks in the Parc la Visite or up to the Citadelle Laferriere. Tour Leader: At your discretion you might also consider tipping your Tour Leader in appreciation of the efficiency and service you receive. In North America tipping is a recognised part of life across the service industry, including restaurants, activity suppliers, taxis and guides. Local staff will look to members of the group for personal recognition of particular services provided. To assist with this the Tour Leader may organise a group tips kitty for included activities and meals, they will then account for kitty use throughout the tour. For this we suggest US/CAN$ 40. For all non-included services and meals on your North American trip, we recommend tipping at around 15%. Bring your money in US$ cash. Banks or 'Forex' offices in main towns/cities. Your tour leader will advise you on arrival. Widely accepted just about everywhere. Haiti: Visas are not required for UK, New Zealand, Australian, US and Canadian citizens. Other nationalities should consult the relevant consulate. An ability to swim is essential for your safe enjoyment of the water based activities on this trip. If you wish to participate in these activities then we insist that you are able to swim. Nothing compulsory, we recommend protection against typhoid, tetanus, diphtheria, polio and hepatitis A. Please check the latest requirements with your travel clinic or doctor prior to departure. The above is not an exhaustive list. Further information regarding vaccinations and travel health advice can be found by following the NHS and NaTHNaC links at Explore Travel Health and from your local healthcare provider. Visa and vaccination requirements are subject to change and should be confirmed by you before travelling. Haiti is still relatively unexplored, and this trip is an opportunity to visit with local guides, and learn about the country's fascinating history both past and present. A visit to Haiti is not only a personal pleasure, but tourism is also a positive way to help the economy by spending money in locally run restaurants and markets.